My dad made me wooden soap molds to replace the cardboard boxes that I have been using as molds. They are 11" x 3.5" and 2.75" deep. They worked perfectly for a 10-bar batch of soap. Wooden box with a lid. The lid on the wooden mold helps to insulate the soap while it is curing in the mold for the first few days. I line the box with freezer paper before pouring the soap into the mold. The wing nuts enable me to take the sides off when removing the freezer paper from the soap. I can also take one of the short sides off in order to slide a little out at a time and use the mold as a guide when cutting the soap into bars. Have helped me make my cuts more even and straight. 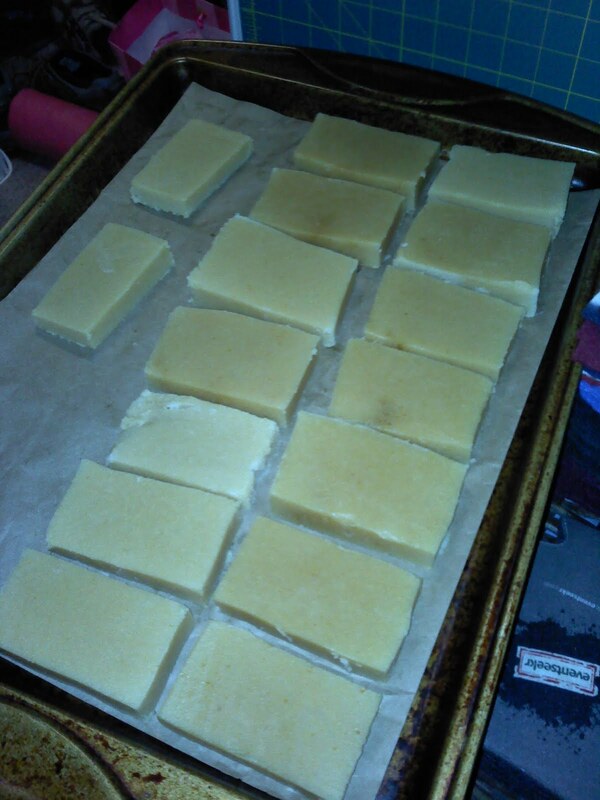 The latest batch of soap- Lemon Eucalyptus with Honey and Vitamin E. A little more evenly cut than my other batches, but I still need some practice cutting them the same size. I admire the quality work on this one. It is perfect for any bathroom and it has a nice nature allure to it. Great quality wooden soap make here.